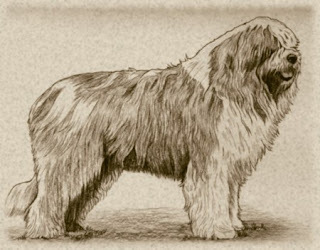 The South Russian Ovcharka is one the largest breed in dogs. They are very eager and bold. This breed of dog is used for guarding and as watchdogs, they are very good in guarding and protecting the livestock. This breed is not for every one, they can be dominant, sometimes which can be dangerous, for the first time dog owners. This breed has a dominant attitude, which distinguishes, them from others. This breed of dog requires, early socialization and obedience training, to prevent aggression problem. This breed of dog possesses aggression and is very brave and are known to be very alert and can protect their family and territory. They are suspicious with strangers and alert their masters, about any security problems. They are not very good with children, however, can do well with older children, if they have been given a proper training. The South Russian Ovcharka has a thick double coat. The coat should be long, thick, dense, and somewhat coarse. The undercoat should be soft, thick, and well developed. This breed of dog likes to be independent and does not like to obey commands from different people. They require a dominant handler, who has the knack to train them, the training must be given on regular basis and consistently. The South Russian Ovcharka has a thick double coat. This breed of dog requires, daily brushing of its coat, to prevent it from dirt and dead hair. The bathing should be given when its needed. They do not have known health problems.